The Nasher Museum has celebrated its first decade as a major center for the arts on Duke University’s campus and in the surrounding Research Triangle area. The museum organizes and presents leading-edge exhibitions that travel to institutions worldwide, including Southern Accent: seeking the American South in Contemporary Art (2016-17), Archibald Motley: Jazz Age Modernist (2014), Wangechi Mutu: A Fantastic Journey (2013), The Vorticists: Rebel Artists in London and New York, 1914-1918 (2010) and Barkley L. Hendricks: Birth of the Cool (2008). The traveling exhibition El Greco to Velázquez: Art during the Reign of Philip III was named one of Time magazine’s top 10 shows of 2008. The strengths of the museum’s permanent collection are Medieval art, art of the Americas (largely pre-Columbian), Classical Antiquities and modern and contemporary art. The museum’s contemporary collection features a growing list of artists, including Hank Willis Thomas, Jeffrey Gibson, Carrie Mae Weems, Ebony G. Patterson, Nick Cave, Barkley L. Hendricks, Christian Marclay, Wangechi Mutu, Ai Weiwei, Fred Wilson and Lynette Yiadom-Boakye. More than 1 million people have visited the museum since it opened in 2005. The 65,000-square-foot Nasher Museum was designed by architect Rafael Viñoly and built in 2005. 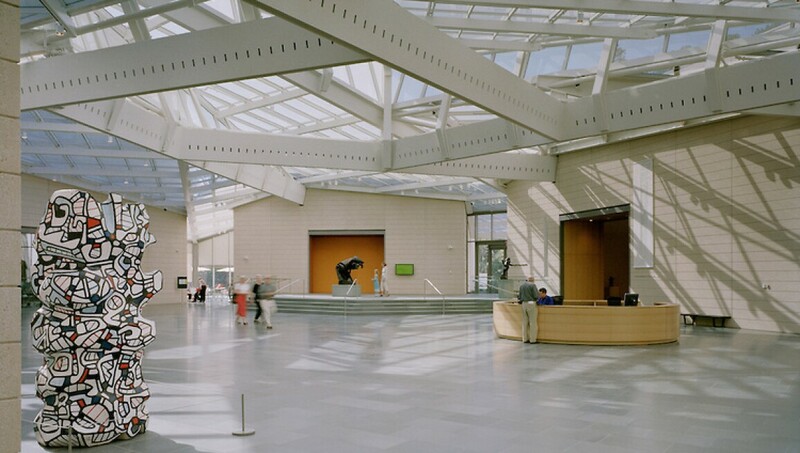 The centerpiece of Viñoly’s modernist design is a dramatic 13,000-square-foot glass-and-steel roof rising to a height of 45 feet above the great hall. Five concrete pavilions fan out from a central courtyard to house three large gallery spaces, auditorium, two classrooms, shop and café. The museum presents a dynamic schedule of programs, including free Family Days, performing arts events, lectures, film series and social gatherings. The Nasher Museum’s growing permanent collection includes some of today’s best contemporary art, with a rare focus on work by artists of African descent. Other major strengths in the collection include European medieval art, European and American paintings, Outsider art, classical antiquities, African art and ancient American (Pre-Columbian) art. All of this work is featured within The Collection Galleries in Wilson pavilion. Formerly the Duke University Museum of Art, the museum was founded in 1969 with the acquisition of 200 medieval works from the Ernest Brummer Collection. The museum was housed in a former science building on the East Campus until the new building opened on Duke’s central campus in 2005. The museum was renamed the Nasher Museum of Art at Duke University, in honor of the late Raymond D. Nasher, Duke alumnus, collector and benefactor. ceramic, H. 6 7/8 in. D. of mouth 10 5/8 in. D. including handles 13 ¾ in. D. of foot 4 5/8 in. Gift of Barbara Newborg, M.D., from the collection of Walter Kempner, M.D. Gift of William S. Judy, Jr., M.D.